The Peachtree Wind Ensemble has served as the Southern Crescent's Community Band since 1991, offering musicians and the community opportunities to enjoy music together in and around Fayette and Coweta Counties, Georgia. Are you an adult musician who would like an opportunity to play in a concert band again? If so, you've come to the right place! 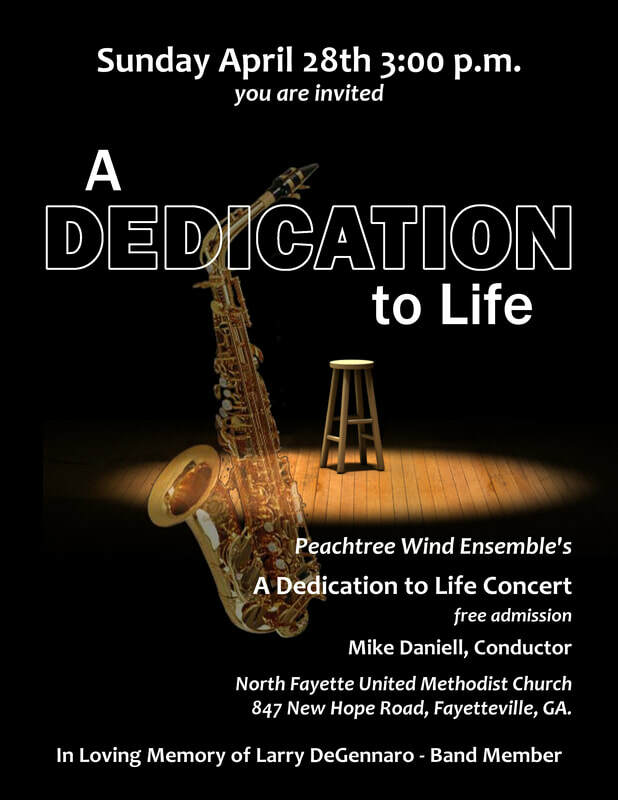 The Peachtree Wind Ensemble is a full-sized, non-audition, community concert band that rehearses and performs in and around Fayette and Coweta Counties, Georgia. Its members come from all professions and include amateur musicians, music professionals, and those returning to music. PWE rehearses Monday nights, 7:30 - 9:00pm, 11 months out of the year with breaks during summer vacation and winter holidays. Under the direction of Mike Daniell, PWE performs marches, jazz, classical/symphonic adaptations for band, Broadway and modern pop songs. If you are interested in joining, please click on "Join Us!"